Petit Pli, the company that sells clothing that grows as the wearer gets older has been given a rebrand which aims to be “more human” and “less technical”. Petit Pli have worked with NB Studio on the rebrand to develop an identity that hones in on the nature of the clothing that is unique in the way that the clothing grows as the baby or toddler gets older. The company is the brainchild of Ryan Yasin who is a Royal College of Art (RCA) graduate and also an aerospace engineer, winning a James Dyson Award in 2017 for his success. The clothes are made from a stretchy, pleated polyester material which expands over time and with use. 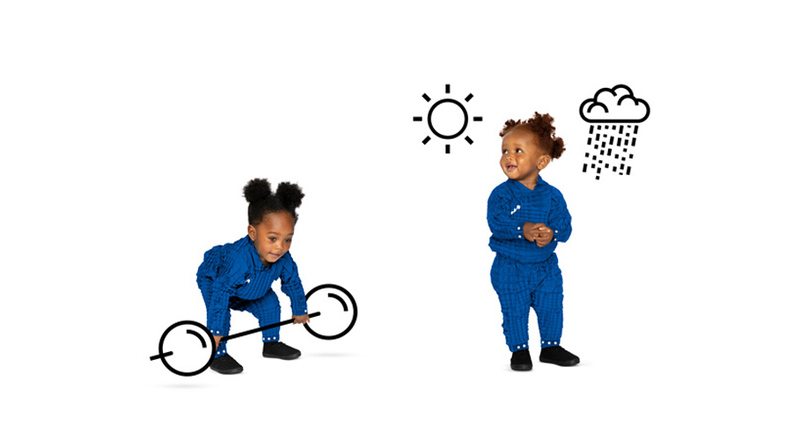 The clothing expands up to seven sizes which takes it up to the age of four. The thought process is that the clothes will save parents money while also reducing clothing waste, as a young child will jump up several sizes in the first few years of their lives. One report conducted by the Centre for Economics and Business Research estimated that parents spend nearly £11,000 on the clothes for one child up to the age of 21. NB Studio’s new logo is inspired by the folded concertina shape which is made up of a misaligned wordmark. The logo was devised by taking a pair of Petit Pli trousers and stretching them out, then placing letterforms on them, allowing the trousers to shrink and then assessing how the letters became disjointed, says designer at NB Studio, Sam Pittman. The thinking was to “let the clothes create the logo” says Pittman. To recreate this with typography the studio adapted the typeface Raoul by warping it to create the effect. Four themes had been considered for the identity says Pittman: sustainability, kids, fashion, and space, bearing in mind that the founder is an aerospace engineer, using his knowledge of the field in the structure of the clothing. This led on to a graphical style of photography along with line drawn illustrations, which highlight the qualities of the product range of Petit Pli. For example, a child lifting weights hints at the strength of the material and a child in the rain shows the clothing is waterproof. “Before, Petit Pli used graphic icons to show product features, such as a water droplet to indicate waterproof. It was quite technical, and we wanted to represent these features in a more human way,” says Pittman. The palette of the branding is monochrome, which is designed to complement colourful clothing ranges, says Pittman, but eventually in the full brand roll-out, black and white will be used alongside three colour gradients in communications: purple to pink-red and blue to white, orange to dark orange. 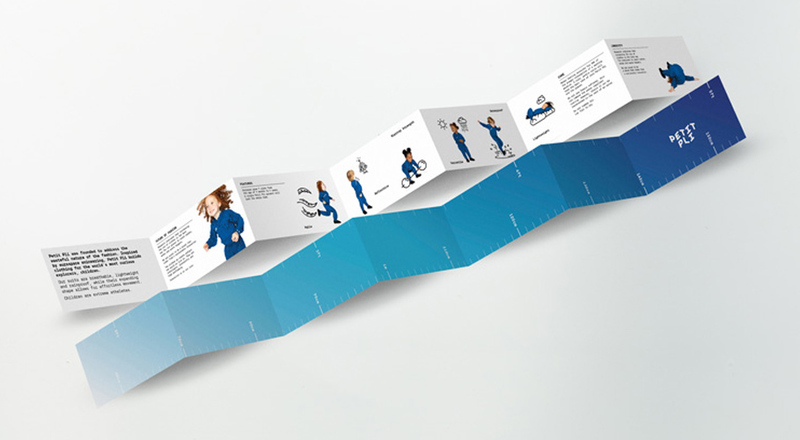 The pleated structure has also been used within the print materials, with the fold-out shape concertina effect being used for the clothing care booklet and business cards. 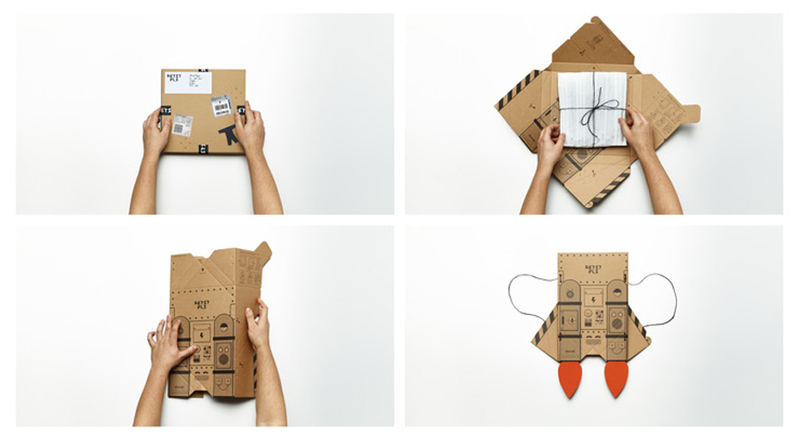 NB Studio have also designed the structural packaging for the clothing products. 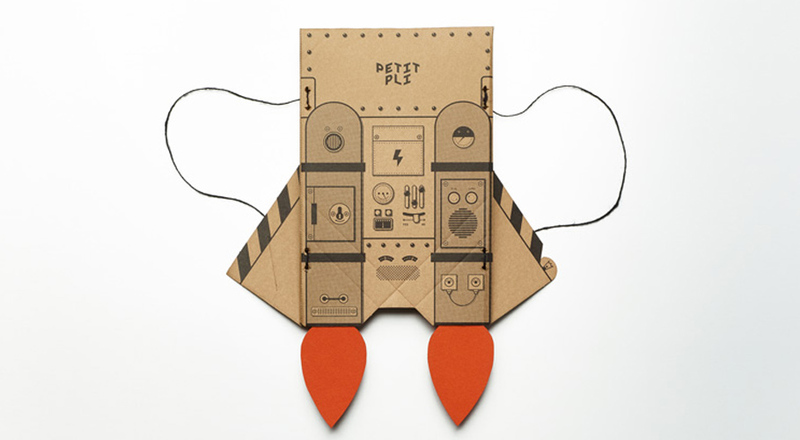 The box that houses the product has been designed in an “origami” style says Pittman, and comes complete with instructions on how to make it into a jetpack after the clothes have been removed from the packaging, allowing the box a “new life” by converting it into a kids toy. The packaging has been sourced from the Forest Stewardship Council (FSC), which gathers recycled wood and paper or that has been taken from well managed forests. 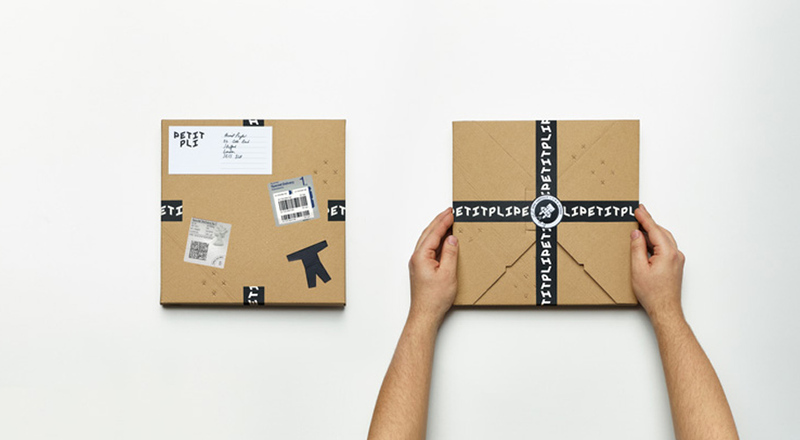 The products are also wrapped in pleated paper that has been left over from the production process of the clothing. “While polyester is not the most sustainable material, the brand is focused on extending the life of clothes, and so reducing landfill,” says Pittman. The new branding is currently rolling out, taking in print and marketing materials social media and website and product packaging. The structural packing has already rolled out.